Odyssey in the Tucson Weekly! and you will be directed to it in the future. Six people are invited to tell ten minute personal stories on a theme in front of an audience. The stories are not read or memorized, they are told from the life experiences and creativity of the teller. tax deductible contributions to Odyssey! Check out the recent article in the Tucson Weekly about the DIY show here! We have selected all of the monthly themes for 2016. Check them out at our calendar page! If any of the themes resonate with you, please contact us about being a storyteller! Check out Downtown Tucson Partnership Online’s story about Odyssey by clicking here. Check out the recent Southwest Folklife Alliance’s story on Odyssey by clicking here. Odyssey is in the process of starting a podcast and is looking for local musicians to contribute music. This could be a great way to reach a local audience and gain exposure. Contact us if you are interested! 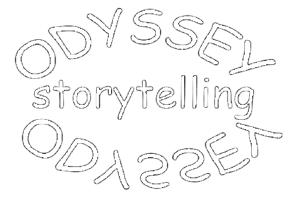 Contact stories@odysseystorytelling.com for more information and to join the community storytelling movement! Willow Sibert shares a spooky tale at the “Out of this World” show.